Kelvin Anderson, VIP Records owner, youth mentor and music industry mover-and-shaker. Photo by Matt Cohn. For the first time in decades, visitors to the strip mall at the corner of Pacific Coast Highway and Martin Luther King Boulevard won’t experience the music and incense wafting out the door of the internationally famous music store VIP Records. VIP owner Kelvin Anderson has determined that his days as a record shop owner are done. In the record business since the 8-track era, Anderson has always stocked the best in R&B, Hip-Hop, Blues, Jazz, Gospel and Reggae. He also helped spawn a generation of West Coast Hip-Hop artists, most notably by hosting the recording in his back-room studio of a young trio called 213; high school buddies Nate Dogg, his cousin Snoop Dogg, and their friend Warren G.
Music aficionados from all over the US and as far away as Japan have been stopping into the shop this week to pay respects to Kelvin, the iconic VIP Records sign on PCH, and the head-nod beats, fat bass and snakey synths of the Long Beach “G-Funk” sound. 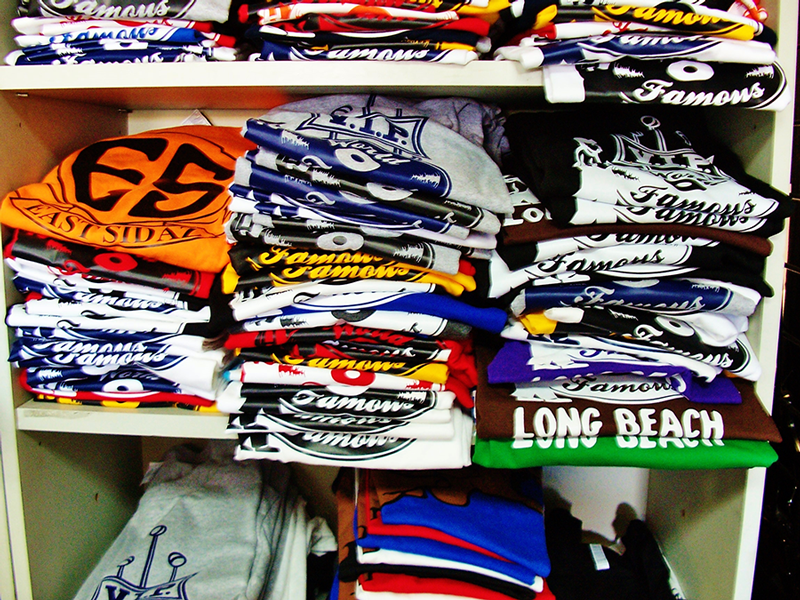 The VIP Records empire (12 stores in the L.A. area during its heyday, all owned and operated by Anderson family members or close associates) was started by Kelvin’s older brother Cletus, who had left the Anderson home in Brandon, Mississippi in the early ’60s to land jobs in L.A., painting cars for General Motors and painting planes for Douglas Aircraft. In 1974 Cletus opened a VIP location at 28th and Crenshaw. “To me, that was the best VIP ever,” said Kelvin. “Business was unbelievable. We had a lot of celebrity customers like Redd Foxx, Barry White, the Soul Train dancers…..I really learned a lot in that span of time, and I really connected with industry people,” he said. By this time, Kelvin had become general manager of VIP Records and had developed a keen ear for music and a knack for sales. “I can’t produce a beat, I can’t write a song, I can’t play an instrument, I can’t even dance—but I know a hit song when I hear one,” Kelvin said. 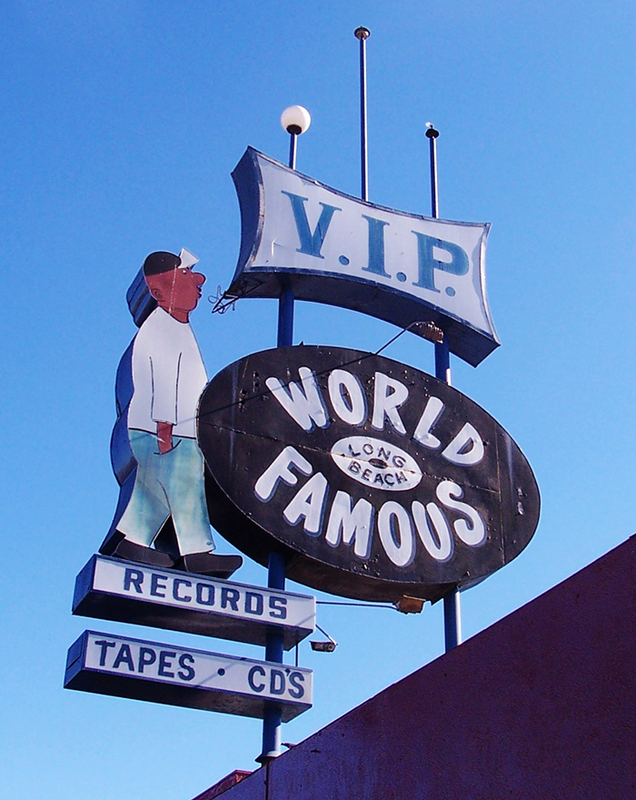 The VIP Records sign on Pacific Coast Highway has become a world-wide icon. Photo by Matt Cohn. 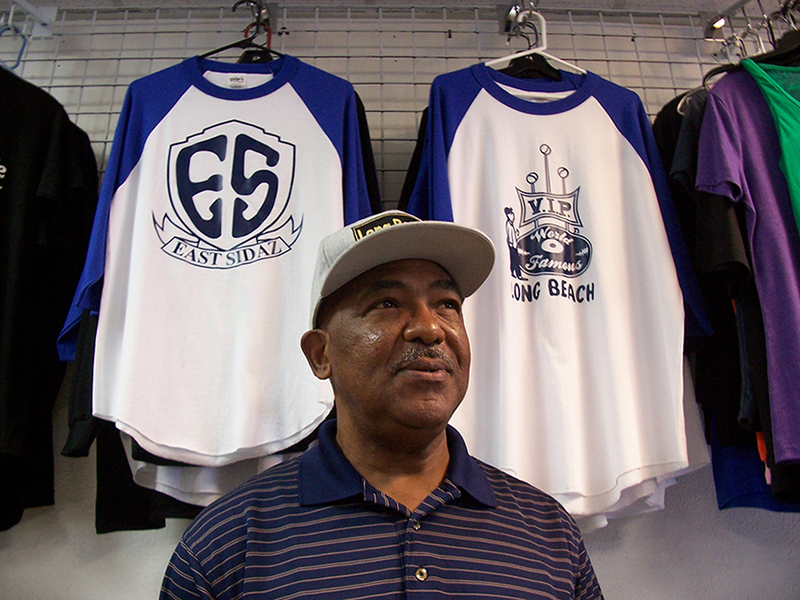 Cletus opened the Long Beach VIP in 1978, and Kelvin bought it from him the following year. VIP had pioneered the use of live DJs in its stores, and Kelvin continued that practice in Long Beach, instructing his DJ’s to watch the movement of the customers and cater to their needs musically. The rise of Hip-Hop in the early ’80s was a huge game-changer for Kelvin and for VIP. A separate entryway was created for the Gospel music section of the store, so its customers wouldn’t be subjected to the earthy language and street-wise attitude of the Hip-Hop being played in the next room. By the mid-’80s, Kelvin was intrigued by the success of Rap group N.W.A in Los Angeles and by Bay Area Hip-Hop artists such as Too Short and E-40. VIP’s Gospel room became a recording studio, with two turntables, a microphone, a drum machine, and a cassette mix-down unit. “It started off to be just a safe place for kids to hang out and work on their craft, doing beats, DJ’ing,” said Kelvin. “It was pretty rough in the streets at that time, a lot of violence going on, so it was a place where people [including future L.A. Hip-Hop star DJ Quik] could come and feel safe. A lot of times, I’d come to open the store at 10 o’clock in the morning and they’d be waiting to get back there, and they were there until I closed,” Kelvin said. Soon, word of Kelvin’s efforts got to Sir Jinx, a protege of N.W.A member/producer Dr. Dre. Jinx offered to help Kelvin get a next-level music studio up and rolling. Jinx took Kelvin to Dre’s Inglewood home and gave him his first look at the Emu SP-1200 sampler/drum machine, the bread-and-butter production tool of ’80s and ’90s Hip-Hop. Afterwards, the two went immediately to the Guitar Center on Hawthorne Boulevard, where Kelvin purchased an SP-1200 and gave it to Sir Jinx. Four months later, Jinx had mastered the 1200 and was ready to step up the VIP music production game. 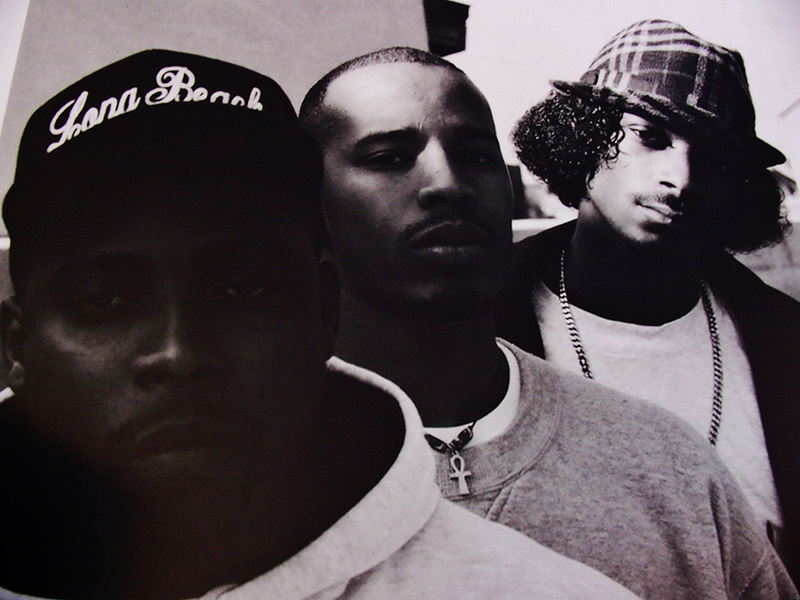 Hip-hop legends (from left) Nate Dogg, Warren G and Snoop Dogg, high school buddies who honed their music chops in the back-room music studio at VIP Records. Photo courtesy of VIP Records. A VIP demo landed a deal with Interscope Records for the local Hip-Hop artist Radio, who had human-beat-box skills similar to East Coast rapper Biz Markie. VIP’s next effort was a demo of the Long Beach trio 213: Nate Dogg, his cousin Snoop Dogg, and their friend Warren G. Interscope A & R man John McLain passed, saying he didn’t think Snoop “had what it takes.” Kelvin shopped the 213 demo at Hip-Hop labels Jive, Tommy Boy, Profile and Priority, without success. Eventually Warren G took the demo to his step-brother Dr. Dre’s house and played it at a party. Dre, impressed, immediately called Snoop into the studio to do vocals on “Deep Cover,” a track from the movie of the same name starring Lawrence Fishburne. Snoop’s unique flow caught lots of ears and made “Deep Cover” the top track from the Deep Cover soundtrack. “Overnight, I had the whole music industry calling me,” said Kelvin. “That’s what launched Snoop’s career.” It also opened the door for Warren G, Nate Dogg, and other local rappers such as Dazz and Domino. Snoop, seen dancing on the roof in front of the iconic VIP sign in the 1993 video for his track “Who Am I (What’s My Name? ),” took VIP Records world-wide. Even as business boomed in Long Beach for VIP, the digital age spelled trouble on the horizon for brick-and-mortar music retailers. Free online music could be had easily, and music consumers moved away from vinyl. Eventually, even CDs became obsolescent. Music shopping, for many, became a matter of a few clicks of a computer mouse. Kelvin plans to stay open through the weekend, and will start packing on Monday. He’s looking for a 1200 square foot storage space in Long Beach or Signal Hill for his soon-to-come online iteration of VIP Records, where he’ll sell T-shirts, posters and memorabilia, as well as items from his huge backstock of LPs, CDs and cassettes. Kelvin’s ideas for his future include the construction of a music museum in Long Beach (possibly even across the street from the VIP Records location) which will feature developments in music technology since the ’60s and will be international in scale. “Something that would go on long after I’m gone,” said Kelvin. Anderson will also be focusing on promoting local Hip-Hop artists such as Lil’ Bam, Eastsidaz, Trey D, Snoop’s LBC Movement and Young Hype. “We’ve always had the structure of the music and the stores being our backbone,” said Kelvin’s daughter, Tenisha. “Me, my siblings, my uncles and cousins all grew up in the store. With the closing of the store, it’s a sad but a proud moment. We won’t be able to be such a set within the community to affect the lives that my family has done for so long, but my Dad has gone through the test of time even when the major chain stores have closed. Excerpt from an unreleased track written and performed by Snoop Dogg in honor of VIP Records. Video by Matt Cohn, with permission from Kelvin Anderson.